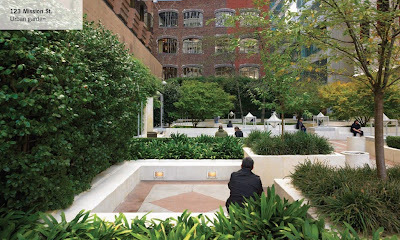 The shortage of public spaces in San Francisco’s downtown has long been compounded by the fact that the urban geography of privately owned public open spaces (POPOS) makes them hard to find and even harder to enjoy. 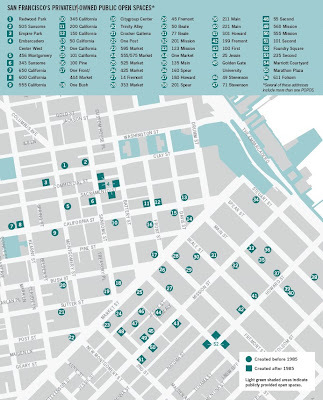 San Francisco Planning and Urban Research (SPUR) released a report that details all of downtown’s POPOS, complete with a printable map (PDF), and makes recommendations on how to improve access and amenities. 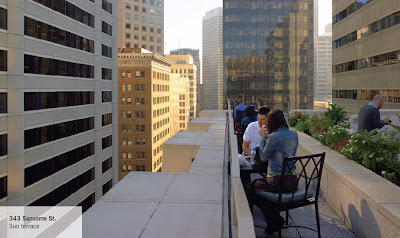 San Francisco’s first privately owned, publicly accessible park was constructed at the base of the Transamerica building in the late 1960s. 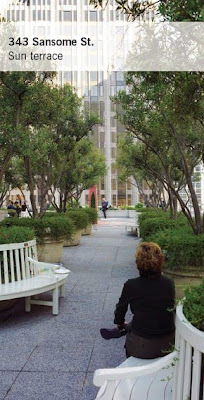 At that time, building codes neither required nor encouraged development of public space at street level, and accordingly most office towers were built right to the edge of the property. 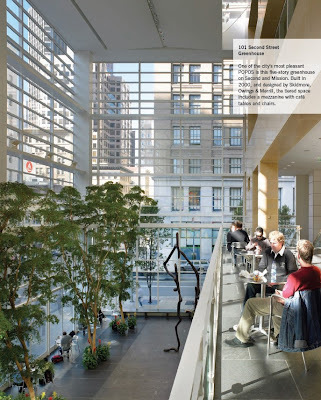 The few exceptions were in buildings where developers sought density and height bonuses and created public space as a condition for approval. 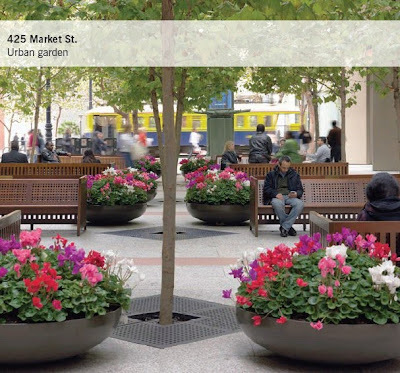 In the 1985 Downtown Plan the city codified the conditions under which developers had to construct publicly accessible open spaces, which could be as diverse as plazas, greenhouses, or atriums, but had to comply with standards of landscaping, design, seating, and bathrooms. 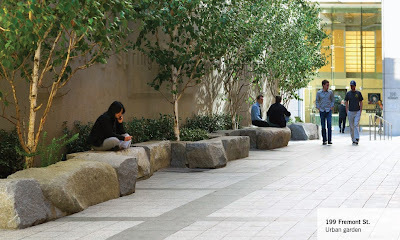 Yet, the city made no effort to provide information about the plazas in aggregate. 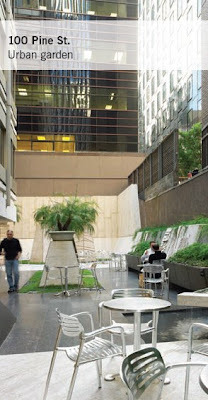 In 2006, with a grant from Southern Exposure Gallery, the art and public space collective Rebar started COMMONspace, an effort to explore POPOS and encourage public participation in them. 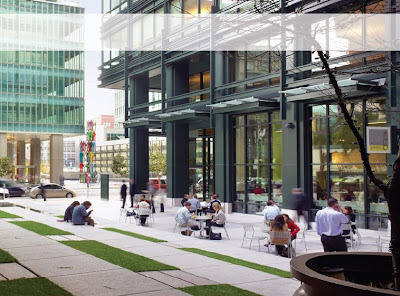 Building off of Rebar’s COMMONspace project, SPUR convened a task force of artists, public space advocates, former planners who had developed The Downtown Plan, and current city planners to review the rules and regulations governing POPOS. 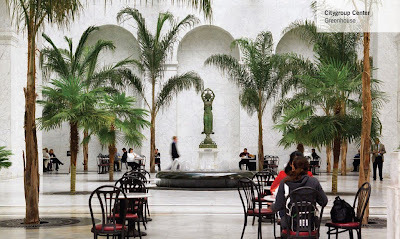 They visited all the POPOS, determined which had been constructed before and after 1985 and established standards for evaluating their success as public spaces.